1500 Quarterlight project now complete! 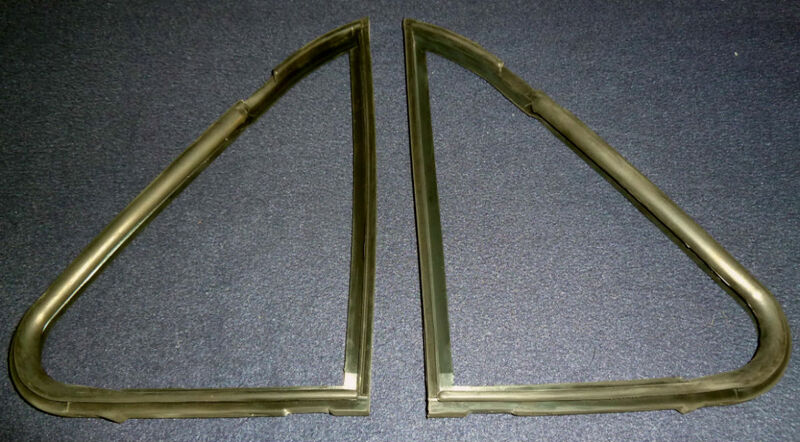 The Wolseley Register’s project to remanufacture new front quarterlight rubbers has finally come to fruition! After 3 years of research, communications, testing and waiting, the rubbers have now been delivered to our partners. This has been the most ambitious Spares project ever taken on by our club, which had to be started from scratch because no previous experience was otherwise available within the club. Research was initially carried out to check whether there was likely to be sufficient demand and that there wasn’t already an existing supplier anywhere else the world. This was then followed by further research into companies that could both produce the moulds and the final rubbers. 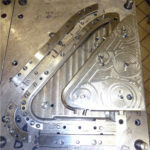 Fairham Mouldings in Blackburn fitted the bill, being able to do all the work required in house and at a competitive cost. It was also agreed, after speaking to many of our partners, that we needed to ensure that the quarterlight rubbers would be top quality, and that it would be worth the higher cost of production to achieve this. 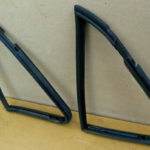 We did understand that some owners preferred the cheaper alternatives of ‘making do’ with repairing old rubbers, or cutting and sticking other cheaper rubbers together (often from Morris Minors), but these options were already available, and what was missing in the market was a supply of top grade reproductions for those owners who wish to ensure their cars were as perfect as possible. The quote provided, although both reasonable and competitive, was still much higher than the Register felt it was able to risk spending on, on its own. We therefore approached both our own Register members, and other owners, via their associated Wolseley and Riley clubs around the world, to ask if they would commit their support by putting a 50% deposit down up front. Sufficient numbers did pledge their support, so that we placed the final order for Fairhams to go ahead with the design and production of the moulds, 15 months ago. The two moulds required (the quarterlights are right and left handed! ), took Fairhams 12 months to fully develop. They are extremely heavy and complicated tools, and having seen them in detail, I can certainly confirm that they are excellent quality. 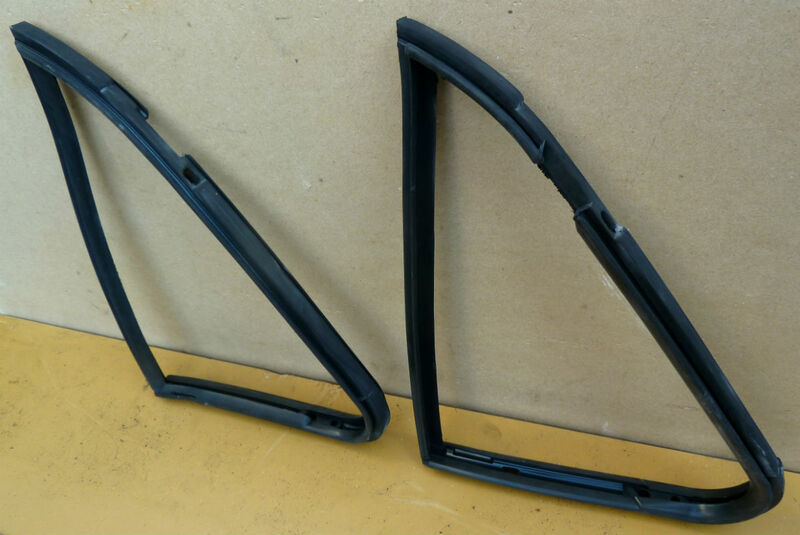 Several rounds of prototype rubbers were produced, each being tested in door frames to ensure a perfect fit, before the moulds were finally signed off and handed over to the Register. The only difference between our new reproduction rubbers and the original factory items, are that the new rubbers are made from EPDM rather than fully natural rubber. EPDM is UV resistent, so will not dry or crack over time, yet it looks, smells and feels identical to the original natural rubber. The final 100 pairs of live rubbers were then produced within 1 month, thus making the full production process from initial order to delivery 13 months. A huge vote of thanks must be given to our partners for their support and patience, some of whom committed their deposits approaching 2 years before they received their rubbers! The project would definitely not have been viable without them. So we now have 1500 front quarterlight rubbers in stock and available to any 1500 or 1.5 owner, with Wolseley Register members receiving a discount. 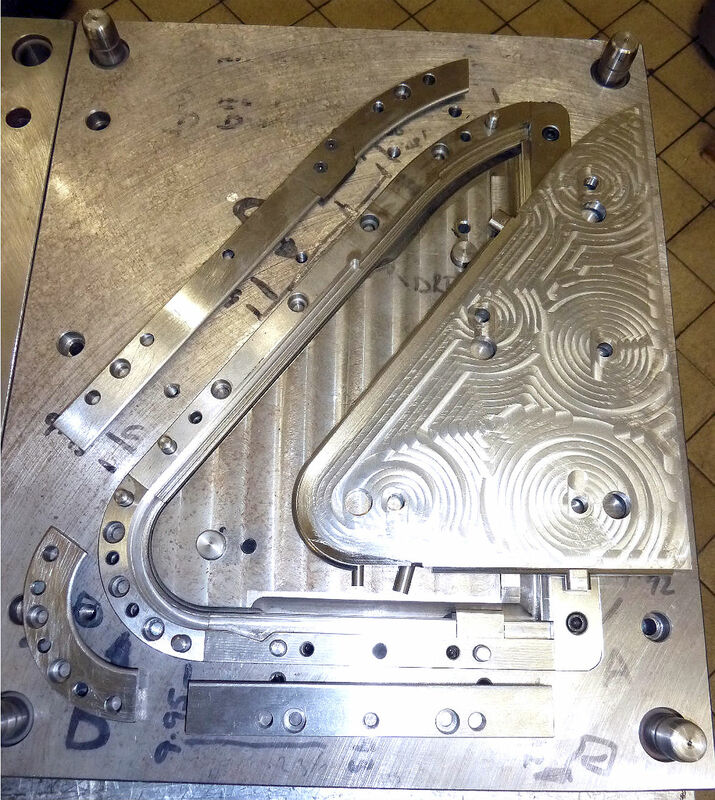 We also own the moulds which we can use to make more batches should there be further demand in the future. Please contact the Spares Consultant , Bob Langston on sparesconsultant@thewolseleyregister.com or phone 01524 761409 for further details. Is there any demand for the Register to look at the viability of producing any other rubber components that are not available anywhere else? For example, we have heard that Farina quarterlight rubbers are also creating concern amongst their owners. Please pass any suggestions to Bob! The FBHVC is withdrawing the BREXIT checklist we published on 5 March. This is obviously because the United Kingdom has not left the European Union without any deal, so the circumstances upon which we were advising did not come to pass. Currently the UK remains a full member of the EU and all existing rules and permissions concerning travel within the EU remain in full force and effect. They will issue new guidance as and when the circumstances become clearer. 1:30pm – Thanksgiving Service at Holy Trinity Church, Lamorbey in Sidcup, DA15 9AE . Directions are here. 2:30 – Refreshments and David’s “final rally” at The Stables, Danson Park, Bexleyheath DA6 8HL. Directions are here. Given that Dave was passionate about classic cars (especially all things Wolseley) his family are keen that, if possible, friends bring their classic cars and so will be arranging off-road parking at the Church and the Stables. If you do plan to bring your car, please email Sarah Allen. All of us in the Wolseley Register, whether we are members of long standing who knew him well, or are more recently joined, must mourn the passing of a very quiet and modest man who devoted a huge amount of his time and energy to working for our club over a very long period. David joined the Wolseley Register in 1970 as member 195, when the Register was run as the ‘brainchild’ of the late Robert Sterndale Burrows. David acted as unofficial secretary to Mr Burrows and to the fledging new committee when the club became a more democratically-run entity, using his great diplomatic skills to smooth the waters of this changeover, only being appointed officially as Secretary at the first AGM in 1979, a post he held until 1990. He was Events Secretary for one year in 1991, and continued to serve his own South East Group, which he established in 1975, organising their first regional rally in 1977. He remained on the national committee for the rest of his life, despite his failing health. 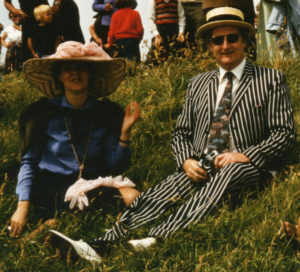 He was also appointed DVLA Officer and FBHVC Representative in 1991, retaining the former position until his death, albeit with a great deal of support from Peter Seaword in more recent years. David was deservedly honoured as Life Vice President of the Register in 1992, and as Life President in 2004 – posts which he filled with great wisdom and understanding, respected and revered by his fellow members. I joined the Register in 1974 after buying our Nine – the first “old” Wolseley, although we owned a Series I 6/110 as our everyday car in the 1960s. My first encounter with David was at the National Rally at Stanford Hall in 1976 (I think), when he and John Brindley welcomed me and my eldest son ‘into the fold’. Somehow Betty and I found ourselves on the Mannekin Pis Tour for the first time in 1979, when we began to realise what a great club the Register is. We also learned what a great sense of fun was concealed behind Dave’s facial foliage once you got to know him, and also his ability to recruit people into jobs without their realising what they were committing themselves to – in my case to being a member of the National Committee ‘without portfolio’ (i.e. general dogsbody) in the early 1980s, ending up as Chairman for the first time in 1990, somewhat to my surprise. During that very busy period in the club’s history and since, I always found David quietly supportive and ready to give sage advice when asked. David was a very skilled engineer and had a great knack of being able to facilitate the remanufacturing of many and varied unobtainable parts over the years, ranging from engine and gearbox mountings, stainless steel hub caps, knave plates to rubber parts including windscreen surrounds for Series cars to petrol pipes. His favourite Wolseleys were the New 10s, having a 1947 black saloon for very many years, which he kept in meticulous order and drove – shall we say ‘vigorously’ all over Britain and the continent. 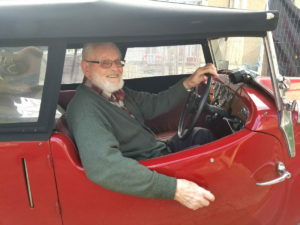 His second New 10 was a red 1939 Eustace Watkins tourer replica which he actually built himself from the wreckage of a saloon – a remarkable achievement and a real labour of love. This car made its debut at the 1994 National Rally, where it caused a real sensation. He also had a 1963 Wolseley 1500, purchased I believe when travelling in the 10 became too onerous for his wife Doreen; again, this was a reliable and well-used car, driven with great panache! David and his wife Doreen spent their working lives in child care and social service. Sarah and Stephen, their children, often joke that they were institutionalised from an early age and shared their parents with the other children in the local authority home run by Doreen and David. Prior to his retirement David worked for the Barnardo’s charity, where he specialised in programme and apprenticeships to help teenagers transition from being in care to being independent young adults. In 2013 David’s left leg was amputated because of severe circulation problems, but with his customary courage and cheerfulness he did not let this deter him from trying to lead as normal a life as possible. He bought a small automatic car and took to the road again as soon as he was allowed to. Along with many other committee members I spoke on the phone on a regular basis (minimum call time one hour plus!) and he was always very positive about life; his main concern was that he was not able to go upstairs to his study to work on the Wolseley archive materials which he had amassed over 50 years, and which is still, despite computerisation of our records, a very valuable asset to us as ‘back up’. His other concern was not being able to drive his beloved Tourer; indomitable as ever David had it converted to hand clutch operation, and was looking forward to mastering the art of driving with this rather unconventional clutch arrangement – I have no doubt whatsoever that he would have succeeded, and that he would have turned up triumphantly at local rallies during the 2019 season in his very unique and lovely Wolseley. David’s sudden and unexpected passing marks the end of a chapter in the history of the Wolseley Register, and he will be sorely missed by all his many friends in our club, the Morris Register and many other clubs who knew and respected his honesty and integrity. We offer our condolences to his children Sarah and Stephen and also to the grandchildren, and hope that the fact that David’s suffering is now over and that he is assuredly at peace with his beloved Doreen will give them comfort. David Allen, Rest in Peace. At our Spares Store itself (located north of Edinburgh), helping with the despatch of spares; and/or attending the occasional ‘Spares Days’ where we sort and tidy the stores when new stock arrives. Collecting small amounts of stock that we obtain near to you and holding these until we can get them to the Spares Store. In addition, if you can use a computer, these parts need to be catalogued, photographed and uploaded to the website. Liaise with our Facebook administrators to ensure linkage and consistency across both platforms. Creating and maintaining the club’s email addresses. The website is built with WordPress software and incorporates a number of plug-ins, but it is not difficult to pick this up and support and training will be supplied to any willing volunteer. In addition, as the role already includes other volunteers, no one person will be required to be available at all times and volunteers will be able to go on holiday! To discuss any of the above jobs, please contact Bob Langston (Spares and Webmaster). Sir Charles Wolseley was a descendent of General Sir Garnet Wolseley and also of Frederick Yorke Wolseley, the founder of the Wolseley Sheep Shearing Company, which produced the first Wolseley motor vehicle in the late 1890’s. Sir Charles was Patron of the Wolseley Register, and the Register had the honour of being invited to attend the opening of the Wolseley Garden Park at Rugeley in Staffordshire, and subsequently held several wonderful annual rallies at the Park and at Park House, the home of Sir Charles and Lady Wolseley after the Garden Park was sold. Sir Charles was a gracious, kind and friendly man and enjoyed attending Wolseley Register events, particularly annual rallies and always with his wife, to whom he was devoted. He was also a brilliant artist, as was proved by the wonderful watercolour painting he produced of the three Gerald Palmer designed Wolseleys (4/44, 15/50 and 6/90) commissioned by the Register to celebrate Palmer’s centenary. The Australian and New Zealand Wolseley clubs, which have a strong and long relationship with the Wolseley Register, also had Sir Charles and in their case Lady Wolseley as Patrons, and vouch for the wonderful hospitality and warmth of welcome they received from their Patrons when visiting the UK. Sadly, failing health prevented the Wolseleys from active involvement in Register activities for the past 10 or so years, but we kept in touch as much as possible, and now mourn the passing of this kindly, courteous gentleman. TheNational Trust is preparing Lady Nuffield’s car for the opening of Nuffield Place on the 26th Feb. Tanya Field, a descendant of the 7th Earl of Macclesfield and a great supporter of our automotive interest at NP will bring along her friends in relevant cars in what has now become an annual celebration of cars made at Cowley. (I am given to understand that it is also the birthplace of Lady Nuffield’s Wolseley 8 – maybe the boss’s one off construction that was closer to home than Ward End). This year the Wolseley will be given more prominence in the story of the property and a feature in ‘Henley Life’, a local magazine with a 10,000 circulation, and in the NT Regional Edition of ‘Near You’, that has a circulation of many thousands to NT members in the surrounding counties. I have emphasised the vital help we have received from the Wolseley Register so I anticipate the Register should get a mention in at least one of the articles. At the end of last year whilst continuing our search for the poor performance under load we found that the petrol filter built into the pump was clogged with muck. Having cleaned the filter the car no longer has to be coaxed (quite so much) up hills with the heart in mouth anticipation of completely grinding to a powerless halt. Could we have found the problem or is it just a temporary sweet spot in performance? All being well this season will confirm our hopes. With renewed hope of improved reliability we want to try and get to a few more local shows. Let’s hope the weather gives us a good summer! A Game-Changer for UK Motor Insurance? Norton Heritage Insurance informs us that we could be seeing huge changes to motor insurance law in order to improve the way victims can claim compensation in a wider range of circumstances. These changes made which will affect all of us. The UK Government have opened a survey for the public to give their opinion on potential changes to motor insurance laws. The survey closes March 2017. The changes being discussed could have a huge impact on the UK insurance industry and the public. To find out more, read the information leaflet here. Finally, please complete the Government Survey here! We have until 31 March 2017 to let the government know our views. More women than ever join the classic car market! 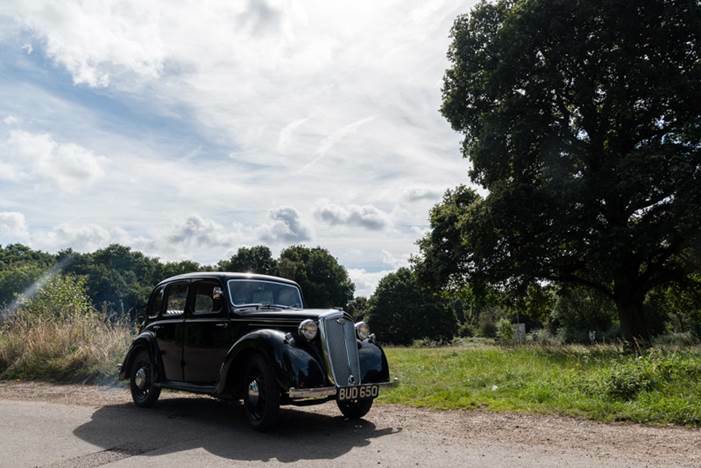 Women are increasingly entering the classic car market and becoming savvier investors in the process, according to new research by classic car insurance broker Footman James, part of the Towergate group. The research, which polled over 2,000 adults*, revealed 1 in 4 women would now consider buying a classic car – clearly showing the classic car club is no longer reserved for the stereotypical middle-aged man. Proving that women really do have an eye for detail, when asked to select models that have risen most in value in the past year female drivers correctly identified two of the top five classic cars that have seen the biggest increases – while men were only able to identify one. Women successfully picked iconic sports car Lamborghini Miura and outdoor favourite Land Rover Defender – which saw increases in value of 62% and 43% respectively over the past twelve months. Footman James’ research also found that on average men spend more each year maintaining their classic spending £1,700 compared to the £1,500 forked out by female buyers. The findings also showed that motivations for entering the classic car market seem to differ between women. More than one in five (21%) said that nostalgia would influence their decision to buy a classic model, while just under a fifth (17%) would be attracted by the investment returns on offer or encouraged by recommendation from a family or friend (19%). “Nowadays the classic car market is no longer an old boys club, with female owners proving their savviness when it comes to picking the top performing models. The popularity of mainstream media has introduced a whole new array of people to the world of classics, reflected in the rising interest from female buyers across the country. 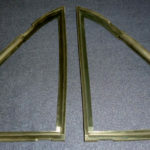 For further information on Footman James visit the website footmanjames.co.uk. The Wolseley Register is sorry to have to report the passing of one of our Vice Presidents, John Brindley, on 11 December 2015. Thank you to members of the Wolseley Register for all their kindness and words of sympathy to me following John’s death; also my appreciation to the many members who attended John’s funeral, several of whom travelled a considerable distance to pay their respects. It was of great comfort to me. I am also very pleased to say that donations made to the Midlands Air Ambulance Charity amounted to £715, which they will be very happy to receive to help fund their good work. When I willingly offered to write an appreciation of the life of John, who had been my friend and colleague in the Wolseley Register for 40 years, it took some time for me to realise that anyone who joined the Register in the past 15 years would not have known the powerhouse of a man who was John Brindley; at best they may have seen him at National Rallies being pushed in his wheelchair by his great friend Henk Schuuring. I hope my inadequate words give some indication of the calibre of John to those who did not know him, and also serve as a reminder of past times and events in the company of John and Margaret to those of us who were fortunate enough to share those times with them. 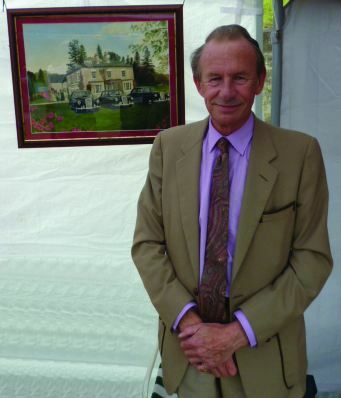 John was a big man, not only physically but in the way he lived his life to the full and in the enthusiasm he brought to his love of the history of the British motor industry, especially Wolseleys. This enthusiasm led to his joining the Wolseley Register when it was established and run by the late Robert Burrows, and to his involvement along with others, notably the late Frank Mansell and our current Life President Dave Allen, in making the Register a more democratically run organisation with elected officers and an executive committee. Throughout the years John was involved in the running of the Register as Chairman of the Midlands Group, and on the National Committee, of which he was Chairman for some years in the 1980s until I was persuaded to take on the role in 1990. John brought great drive and energy into every aspect of Register life, not least in the tremendous hospitality provided by John and Margaret at Pages Lane for the Committee and in fact, for anyone they felt needed “bed and board”. This open hearted hospitality continued long after John stood down as Chairman, and even after John’s first stroke, more than 15 years ago. Thank you very much, Margaret and John . In his “day job” John was a greatly respected consultant structural engineer, working on many projects mainly in Birmingham and the Midlands; during the course of his business travels he “ happened across” more than a few Wolseleys and other historic delights at a time when the old vehicle movement was far less commercialised than it is currently. Consequently John amassed an enviable and eclectic collection of old vehicles and memorabilia, which he housed at Pages Lane and in various lock ups in and around Birmingham. Even after his first stroke John was able to work with Norman Painting on the production of an authoritative book on Herbert Austin’s years with Wolseley (obtainable from Regalia) and he attended as many Committee meetings as he could as Life Vice President until the effort became too great both for John and for Margaret. Remembering John in his physical prime it is hard to imagine that as a young man he actually raced BSA Bantam motor cycles for the BSA works, and very successfully too; without being disrespectful to our colleague it says much for the stamina and durability of those miniscule Bantams that not only did they not wilt under his not inconsiderable weight but under his guidance they actually won many short circuit races. John’s golden days in the Wolseley Register? The Mannekin Pis Rallies in the late 1970s and the 1980s, when we joined in with the Morris Register on some hilarious and occasionally manic tours of Europe, John and Margaret in their faithful 21hp Super Six, along with the Allens, Dave Palmer and Peter, our grossly overloaded 9 (and later 14/60) and several other Register folk. The 1990s, and our celebrations in 1994 of the Register’s 40th anniversary, with the “Round the World” trip of British “foreign places” such as Melbourne near York, when the “baton “ was passed from one Region to the next, culminating in its arrival at the National Rally at Wolseley Garden Park in August. Whilst John was at his busy best in helping this to happen, he really excelled himself next year when we celebrated the centenary of the first Wolseley car by working with Trevor Bland to persuade Birmingham City Council to allow the Register to hold a Rally on Centenary Square on the Saturday of our National Rally weekend. We were the first car club to be afforded the privilege, and more than 200 Wolseleys were on display. Prior to that we based ourselves at Avoncroft historic building museum for several days, darting off to civic receptions, a visit to the Morgan factory, Black Country museum and many other wondrous places – mostly thanks to John and Trevor’s local connections. A wonderful week, culminating in a Police-led parade from Centenary Square to Wolseley Garden Park for Sunday’s Annual Rally; Saturday night saw John engaged in one of his favourite occupations – running the barbecue. Many of us worked hard that week, but none harder than John. Many of our overseas members, notably from the Antipodes, came over for the Centenary celebrations, and issued a pressing invitation to John and Trevor to pay a return visit, which they duly did. I was talking to Trevor about this recently, and apparently despite John’s having travelled all over Europe he had never been on an aircraft before the 11 hour flight to Singapore en route to Australia, and was delighted with the experience, this delight never waning throughout the 7 weeks the pair of them were away. Happy times indeed for John, and we can only hope that during the past traumatic years since John’s first stroke, he has been able to recall the good times with fondness. Those of us who knew him will remember him as someone who did not give his friendship easily, but when he did so gave it unstintingly; if there were disagreements they were usually resolved and set aside. Margaret, please accept our thanks and admiration for the care and love you have shown to John, particularly over the past years of his illness, and be assured that all of us are there for you to help in any way we can. In a recent newsletter we shared a feature on advice for keeping your car in a roadworthy state, and how this affects owners of pre-1960 vehicles. It has been brought to our attention that this article may have been perceived as misleading on the matter of tyres. The article suggested that tyres should be on a vehicle for ‘no more than 5 years’, however this is not correct. “The tyre industry has long recognised the consumerâ€™s role in the regular care and maintenance of their tyres. The point at which a tyre is replaced is a decision for which the owner of the tyre is responsible. The service life of a tyre is a cumulative function of the storage, stowing, rotation and service conditions, which a tyre is subjected to throughout its life (load, speed, inflation pressure, road hazard injury, etc.). Since service conditions vary widely, accurately predicting the service life of any specific tyre in chronological time is not possible. In conclusion, so long as the age of the tyre does not exceed the manufacturers recommended guidance, and so long as ‘due diligence’ is done on behalf of the owner to ensure that tyres remain in a roadworthy condition, then you will be doing all you can to ensure the condition of your vehicle’s tyres complies with the terms set out by your insurance underwriter. It must be noted, however, that each different tyre manufacturer will have their own set of guidelines pertaining to the lifecycle of each given model of tyre, so if you are in any doubt at all about the condition of your tyres, then it’s always worth popping to your local tyre fitter. While some owners have their classics cars safe and snug, holed up in the garage for the winter, other classic users, who drive their cars on a daily basis, don’t have that luxury and are facing driving through the heavy rain and flood water hitting Britain. Driving in wet conditions can be hazardous, and even those with knowledge of their local area can find themselves caught out during heavy downpours, with road surfaces susceptible to standing water. This increases the risk of drivers aquaplaning, when the tyres lose contact with the road and you lose control of the steering. If you do experience aquaplaning, hold the steering wheel lightly and lift off the throttle until the tyres regain grip. When driving through standing water, remember to slow down and take it easy. If the steering does become unresponsive due to the rain, ease off the accelerator and slow down gradually. If you do come across flood water, only attempt to drive through if you know it’s not too deep and maintain a steady, slow speed to avoid creating a bow wave. Allow oncoming traffic to pass first and test your brakes as soon as you can after leaving the water. As you drive slowly through standing water, use a low gear so the engine revs are higher. Don’t try driving through fast-moving water, such as at a flooded bridge approach – you and your car could easily be swept away. Also remember that driving through standing water and large puddles at speeds above a slow crawl will splash pedestrians or cyclists, which can result in a hefty fine and points on your license if the police catch you driving without reasonable consideration for other road users. Follow these handy tips and the only paddling you’ll be doing is at the seaside come the summer! To find out more on this and other services from Heritage Classic Car Insurance, call 0121 248 9213 or visit www.heritage-quote.co.uk. Just six inches of fast flowing water can knock you off your feet and be enough for you to be unable to regain your footing.